In a world where only extremes (and extremists) seem to make the news, the above photo is extremely frightening. California’s dry spring, preceded by a very low snowpack, have left Yosemite Falls high and dry. According to the Modesto Bee, drinking water is being packed into the Sunrise High Sierra Camp and showers — always a camping luxury — are being rationed in Tuolumne Meadows. 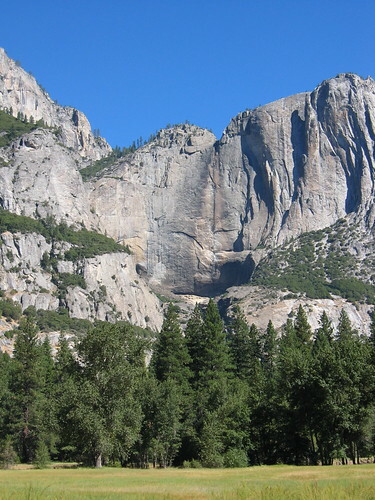 However, as Yosemite falls is barely a whisper of itself, Bridalveil Falls showers the cliffs across the valley. Photo by Graham Jenkin via Flickr.